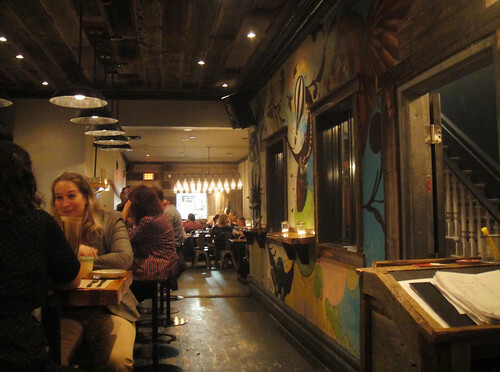 CK and I finally got to try the much talked about Union Local 613. 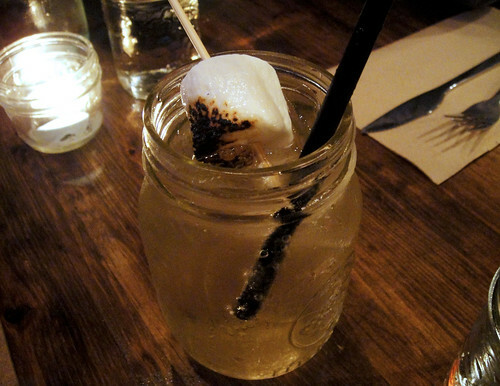 The atmosphere and crowd has a hipster vibe to it, and the food is a Canadian take on Southern food. I knew it was going to be an interesting meal because both CK and one of our guests are both from the South - CK from Memphis and our friend, AT, from Texas - and I knew there was a very good chance both of them would be comparing the food at Union 613 to what they can get back home. I told them to eat with an open mind and left it at that. Another one of our guests, S, had been here a few times already so he specifically requested a booth for us because he mentioned that most of the seating was communal, with slightly uncomfortable stools. S said he was sliding out of his seat the entire night. 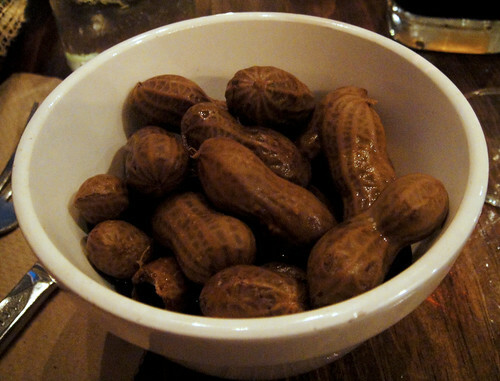 Right after we put in our orders, a bowl of boiled salted peanuts came out. The peanuts are salted overnight and boiled for 2-3 hours before serving. I was really curious on how they were going to taste but it kinda just tastes like what it is - boiled salted peanuts! They were good but hard to open because the shells were so soft. CK ordered a house made cream soda and AT ordered a house made cola. What I like about their house made drinks is that they aren't too sweet. 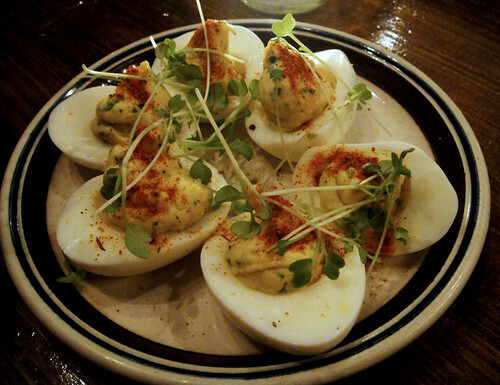 To start, we ordered a plate of deviled bekings’ eggs. These eggs were delicious! Creamy center with bacon, herbs and spices. Definitely a must order for egg lovers. 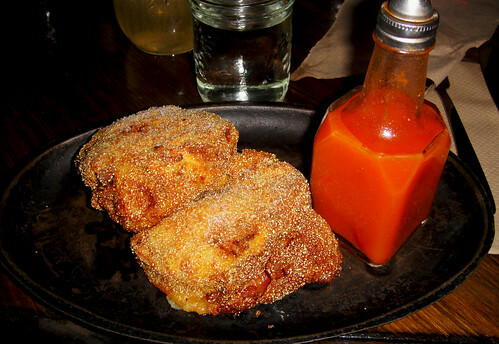 My meal was the 2pc buttermilk fried yardbird with hot sauce on the side. This dish also comes in 4 or 8 pcs. 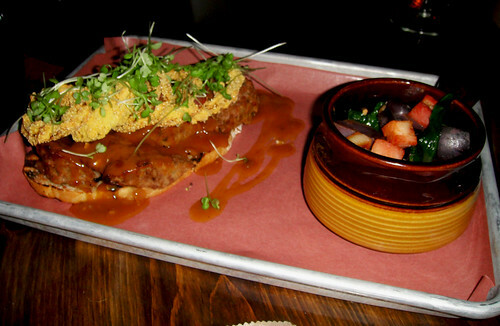 I love Southern fried chicken and this was a clean upscale version of it. The chicken was seasoned really nicely, very moist, and wasn't greasy at all. 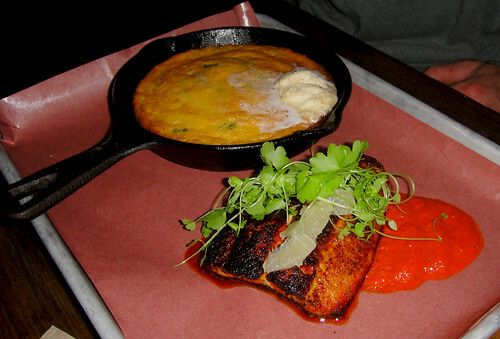 CK and our friend S both had the blackened louisianna catfish with smoked pepper puree, celery cress and pickled limes. They also ordered a side of cornbread with bourbon brown butter. All sides have to be ordered separately with the meals. The catfish was cooked very nicely, but I found the cornbread way too salty for me. S says its salty everytime he orders it. AT ordered the Alberta brisket meatloaf with red eye gravy, onion rings and rye toast. Her side was lucy luke's purple spuds with kale and bacon. 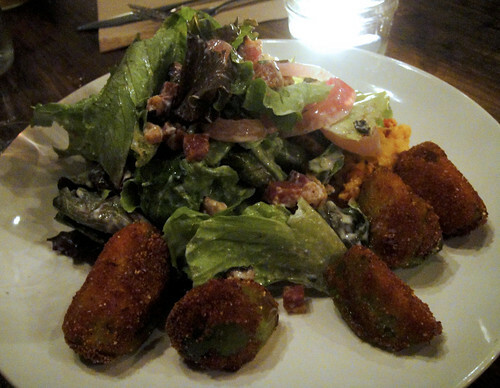 I really enjoyed the kale side dish. The bacon added a really nice smoky flavor. Was the food comparable to what you would get in the South? Not really. It was missing a tad of the 'comfort' part. Part of that is simply more grease and more slow cooking. Was the food good? Yes, definitely. But it's more like Canadian food with Southern influences. Interesting:) Your photos are always so nice to see..